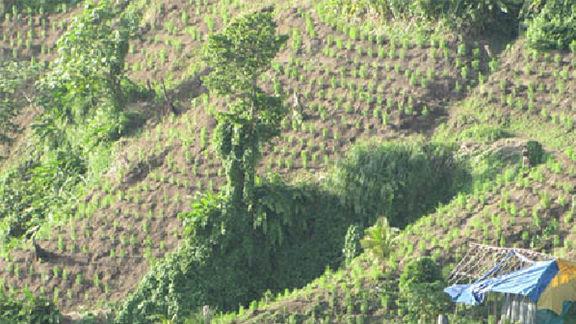 Marijuana fields on a St. Vincent & the Grenadines mountain side. News Americas, NEW YORK, NY, Weds. Nov. 21, 2018: Another Caribbean country could move as early as tomorrow, Thursday, Nov. 22, 2018, to make medical marijuana legal. The St Vincent and the Grenadines Parliament is expected to approve laws on Thursday, laws establishing a medical marijuana industry in the country. The bills — the Medicinal Cannabis Industry Bill, The Cannabis Cultivation (Amnesty) Bill, and The Permitted Use of Cannabis for Religious Purpose Bill — were sent to a parliamentary select committee for review after Minister of Agriculture Saboto Caesar presented them to lawmakers on September 7th.